When you are younger, an active lifestyle might conjure up images of mountain biking and skiing and other intense athletic accomplishments. But when you’re older all it means is getting moving regularly. Instead of resting in your recliner, take your pet for a walk or meet a friend to wander through a local garden or nature trail. Park a little farther from stores, or create a regular stretching and exercise routine for while you watch the nightly news. You can even lift barbells from the couch. It doesn’t take a lot to improve balance, motor skills, strength, endurance, and even memory retention. Not only are the health benefits huge, but so will the impact on your independence. Rather than having to turn down plans because you don’t feel up to it, or unable to go about daily tasks like cleaning and entertaining as you used to, you’ll feel stronger and more confident. 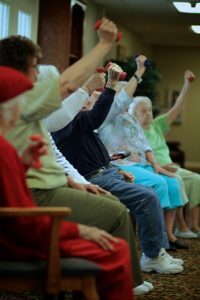 Exercise is the key to feeling younger, and being able to stay involved in the world. It’s the number one thing you can do to make sure your independence isn’t limited, and that you can do all you want to do!